Many people loose or misplace their mobile phone around the world daily and they try hard to get their mobile phone back. They go and search their phone in many places. Some of them find their mobile phone back and unfortunately most of people never find their mobile phone back. If you lost your phone and you have never installed any app to track back your phone then you don’t have to worry. We are here to help to find your mobile phone back. You have not only lost your mobile phone. You have lost your lots of sweet memories, contacts and most important your privacy. Don’t be worried, you can find your android phone back. There are two ways to find or track android mobile phone. It is Google made tool to track or find location of your lost phone. You can find your lost phone by using any device as- laptop, mobile or tablets. Now there are few requirements for this websites to find the lost or misplaced mobile phone. Your device has to be connected with internet. Your device has to be connected with your Google account. Android device manager has to be allowed to locate your device (basically it is turned on by default). ADM (android device manager) has to be allowed to lock your device or to erase your data (basically it is turned off by default). Now you have to visit the website of android device manager. Once the website is loaded, you have to sign in into your Google account. 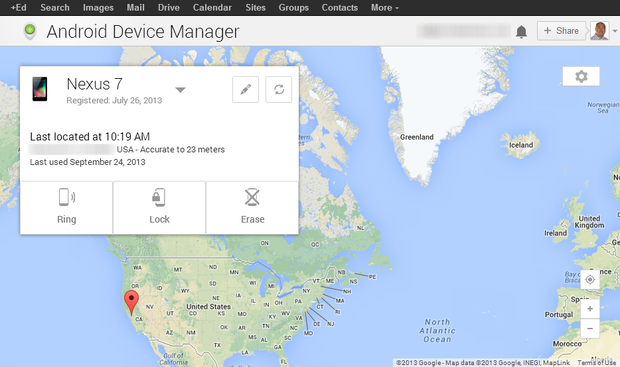 Once when you signed in then you will find that android device manager is trying to locate your device. Once it found your device, you can choose many actions as – you can ring your device for five minutes, you can know your device location or you can wipe your all data. If ADM cannot find your device, this means either your mobile have switched off or your device is not connected with your Google account. So you have to wait until your device switched on. You device have to connected with your mobile phone otherwise you device never be tracked. So you have to wish that your device have to connect with your Google account. If you have no laptops at that time you can follow above instructions by using any android device as mobile phone or tablet. It is another easy way to find or track your lost or misplaced mobile. By Google map history you can know your mobile location history. This is the fastest way to track down your android lost. You can also know the last location of your mobile. So follow the step and try to find your android device. There are few requirements to know your mobile location. Your device has to connect with internet. Location history and reporting must be enabled in Google map app on your device. If you think these requirement is fulfilled by your device, ready to track your lost or stolen mobile. Google map is not made for tracking mobile but you can know last location of your lost or stolen mobile. Now you have to follow the following steps to know last location of your mobile. Now open the internet browser and visit Goggle map location history. Sign in to your Google account and select today’s visiting place. Now you have to click on ‘timestamps’. Now you will see there the current location of your device. If there is internet access in your device and connected with your Google account, you will surely see the current location of your device. By using the timestamps, you can know the place where your device is visit two three times. Now go and search there, you will surely find your lost or stolen mobile. It is another smart way to know about the people who have stolen your phone. Here are also some requirements to know about thief. Activated ‘Camera uploads in drop box. Thief has to take his picture in your device. You have to remember your email Id and password by which you login to drop box. In Samsung mobile drop box is already installed. Actually this not a antitheft app but you can use it smartly for it. Camera uploads must be activated in drop box. Internet must be accessed in mobile while the theft takes his photo. Every time when thief takes selfee in your phone, it will automatically upload in drop box. Now write drop box in any internet browser and search. Now you have to remember your email id and password by which you log in to drop box. If you remember, log in. You will see there the uploaded Latest photo. See and show other to recognize the man who has stolen you mobile. If you lucky you will also know about location by background. So this way, you can find or know about you’re the man who have stolen your mobile phone. It is also the easiest way to find or track your lost mobile phone. Air driod has also similar features as android device manager. It provides some feature besides it like as – lock, wipe, erase and taking pictures from camera. We have lots of memories in our mobile phone as- party pic, selfie with friend and with lovers and many other important documents etc. If we don’t have uploaded in any storage app, we can lose important documents. You can upload your important documents and pics on web from your airdroid account before wipe your phone and the most amazing things is that the thief will never know that something is going on in your mobile. You can also click real time pic from camera to see where your mobile phone is. You can use both front and back camera to see the person who using it and take photo and save in your pc. So these are some easy way to track or find your lost or misplaced phone without using any app. By Using the above method mobiles phone of any company such as Samsung Mobiles, Karbonn, Micromax, LG, HTC,Motorola can be found. You don’t need to ever search for “where is my phone” on Google. This entry was posted in Find Android Phone Without App and tagged how to find android phone without app, How to find mobile without app, How to Track Android Phone with AirDroid, How to Track Android Phone with Android Device Manager, How to Track Android Phone with DropBox, How to Track Android Phone with Google Location History on August 29, 2016 by satyenhacks.